Vancouver, Canada -- While the world's attention turns to the truly compelling stories of human resilience behind every Olympic medal to be won in Beijing next month, another human drama is unfolding, one that will define the legacy of a man beloved by millions worldwide. The Dalai Lama is facing a terrible choice. The talks between his representatives and those of the Chinese government have, predictably, produced nothing. Tibetans in Lhasa are still being repressed, arrested without cause, imprisoned without charge, stripped of their civil rights and maligned by China's propaganda. Tibetans in the worldwide diaspora are clamoring for some sign of progress from China, not for independence but for basic civil rights and cultural protections. The Dalai Lama is not just a political leader, he is a spiritual leader. And the fundamental tenets of the Buddhism he embodies for millions around the globe inform his belief, so intrinsic to who he is that he could no more disavow it than commit murder, that he must not do anything that would hurt his enemy. While this position is admirable in a spiritual sense, it puts him at a lethal disadvantage in dealings with a regime that has demonized him, repressed his people and that only keeps up the appearance of dialogue long enough to get through the Olympics but, clearly, will be no more amenable to meaningful change after the games are over and the global spotlight has moved on. The time has come now that His Holiness the Dalai Lama must make the difficult choice ­ choice between his Buddhist principle and his people. This is too much to ask of a simple Buddhist monk, but he must make that choice. All his sincere overtures over the years have produced no tangible result other than Beijing retreating back to its initial position that there is nothing to talk about as to the future of Tibet except the Dalai Lama's own personal status. China's position on the talks was summed up in a statement by the new director-general of the information office of the State Council, Mr. Dong Yunhu on March 16th: "The central Government will never discuss the future of Tibet with the Dalai Lama. What we can discuss with him is his future and that of some of his supporters." 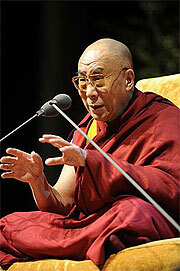 He further stated "I don't think (the Dalai Lama) is qualified to represent Tibet. If he ever did, it was before 1959" - when he fled to Dharamsala in north India after a failed uprising. After seven rounds of talk since 2002, when the Dalai Lama started sending his special envoys to meet with Chinese officials and negotiate the future of Tibet, all Beijing has done is stall, taking advantage of their unique advantage in having an interlocutor bound by his every breath to uphold peace, nonviolence and compassion. The Olympics, China's coming-out party as an increasingly accepted member of the international community, are less than ten days away and Beijing is so paranoid about ensuring that the games go smoothly they have demanded that the Dalai Lama control any trouble makers. If the Dalai Lama were the sort of man to be ordering or canceling protests, Beijing's bilateral relationship with him would have unfolded very differently. The Dalai Lama needs help. If any diplomatic process ever required the involvement of a third party mediator, this is the most glaring example. An international mediator would ensure that the positions of both sides are weighed fairly against the measures of history and international law, would neutralize the propaganda that has so clouded the real issues at stake and would legitimize the outcome of a process that will impact the lives of millions. It is the very least the world can do for a people who have paid the price for China's success for too long. "Chinese brothers and sisters, I assure you I have no desire to seek Tibet's separation. Nor do I have any wish to drive a wedge between the Tibetan and Chinese peoples. On the contrary my commitment has always been to find a genuine solution to the problem of Tibet that ensures the long-term interests of both Chinese and Tibetans. My primary concern, as I have repeated time and again, is to ensure the survival of the Tibetan people's distinctive culture, language and identity. As a simple monk who strives to live his daily life according to Buddhist precepts, I assure you of the sincerity of my motivation." I love, admire and respect His Holiness as a faithful servant for the past three decades and as a longtime supporter of his Middle Path approach to our future. But I have changed my mind for his sake as well as for the sake of Tibetans, Chinese and all people everywhere who believe that this is a true test of whether tyranny and repression will be welcome in this new international order. The clock for the people of Tibet is ticking. The Dalai Lama must demand international mediation in talks with China now or the Tibetan people will have lost their battle for justice and he will have lost his own quiet, lifelong war against those who believe good cannot prevail.